The new Euro-6 diesel vehicles all require the usage of AdBlue to reduce NOx pollution. AdBlue is an ammonia based fluid, stored in a separate tank in the vehicle. The filler neck of this tank is located next to the diesel filler neck. To prevent that AdBlue can enter the Diesel tank which causes serious damage to the engine, the AdBlue nozzle has to be released by a magnetic system located in the filler neck. The magnet ring inside the filler neck is prescribed in an ISO standard and is produced by Bakker Magnetics since 2011. 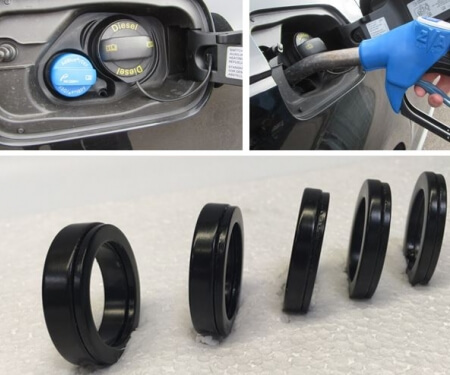 Together with a leading German manufacturer of innovative Fuel Cap Technology, we developed a magnetic system that switches all available nozzles while using half the height and half the weight of the current magnet. If you are interested in receiving the animated version of the added product presentation SCR Hybrid Magnet or if you would like to receive more information, please contact our product manager IJsbrand Velzeboer at ij.velzeboer@bakkermagnetics.com or +31402678820.